Pressure rating up to 4000 psig (275 bar) for 316 stainless steel and up to 3000 psig (206 bar) for Carbon Steel and Brass at 100°F (38°C). Temperature rating from -65°F to 600°F (-54°C to 315°C) with Stainless Steel from -65°F to 400°F (-54°C to 204°C) with carbon steel, from -20°F to 350°F (-29°C to 177°C) with brass. Vent hole bleeds excessive liquid or gas from system lines. 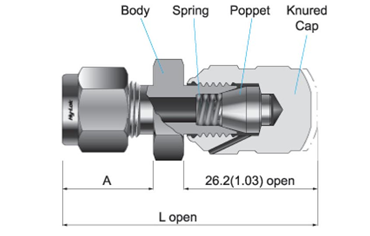 Knurled cap is crimped to valve body to prevent accidental remove from body.